I know it's been a while, but things have DEFINITELY been happening in the background of The Suitcase Studio. If you want to know the details through today, be sure to follow me here on Instagram. But today found me hard at work behind the scenes again... deep in the zone working on some AWESOME new plans for the brand, and I totally can't wait to share with you all soon!!! don't miss out on a spring session! If you were hoping for a FUN family photo session this spring, you'd better hop to it! The remainder of April is fully-booked, and May is getting filled up fast. From now through the end of May, I've only got space for TWO more Signature Sessions. Click here to snag a spot before they're gone. A $75 non-refundable retainer fee is required to reserve your timeslot. The remainder of payment will be due on the day of your session. Additional prints + products will also be available for purchase. Holiday cards are available for easy purchase through Minted.com. To book your session, click on one of the dates above. Heads up... these are the LAST mini-sessions I'll be offering for 2013! There will be NO minis offered in December, so don't wait too long to snag your spot! Have something else in mind for holiday photos? Would one of my Signature Sessions work better for you? I've only got THREE dates left open for full sessions in 2013, so contact me ASAP if you'd like to sign up for one of them. I sat in the driver's seat of my car in the parking lot; windows rolled all the way UP in the stifling heat, as to somehow create a safe space for me to think. I clutched my cell phone like the lifeline it was... as my husband was on the other end. Tears rolled down my face, totally unchecked. My voice cracked with every syllable uttered, and sent even more tears rolling. I was making a HUGE decision, and it was scaring the bajeezus outta me. Excitement, fear, possibility... all squeezed into this tiny suffocating car with me. And then my husband said something to me that I've said to HIM on many an occasion... "If it doesn't scare you a bit, it's probably not big enough to be worth it." With that, my mind was calmed, and my decision was made. The fear was still there, but I wasn't going to let it stop me. And my excitement at the possibilities grew larger and larger. And now, on the day of my 35th birthday, I have something exciting to share with you all. Announcing... MY NEW STUDIO SPACE!!! The Suitcase Studio officially has a HOME now, and I can't wait for you to see it! Not just a great place for client meetings, it's also a FANTABULOUS place for photo sessions, as well. (yeah, that's right... I said fantabulous.) I'll officially have access to both The Lab and The Camp for portrait sessions (and if you've been there, you KNOW the possibilities that those places hold). My own building also has a built-in backyard already equipped with trimmed green grass, wooden benches, and even a silver airstream trailer. It SCREAMS out for a photo session, doesn't it? And, of course, my own office has plenty of space for all those stylized mini-sessions I've been dreaming about for oh-so long. Want to help me break in my NEW studio space??? Let's CELEBRATE!!! I'll be taking possession of my new place on September 15th, so I've set up two days of celebration-themed mini-sessions for soon after. The first 5 people to sign up for a mini-session will receive theirs for FREE! That's RIGHT. Be one of the first FIVE people to sign up for a Celebration mini-session (either day is fine), and you'll receive your session and 8x10 for FREE! Just be sure to enter code HAPPY35 upon checkout. I hope to see you all real SOON! When it comes to taking pictures and editing them, I hear a LOT of people say "Oh, I'll just get what I can and fix it in Photoshop." Confession time: that used to be me. But not anymore. When I take a picture, I have a finished image already in mind. I compose my shot the way I want it to be... cropping in-camera and making sure my angles are lined up properly. I also change my camera settings constantly, as the light & color changes from moment to moment, direction to direction, surrounding to surrounding. Because of this, my editing has gotten a LOT faster. My shots are pretty close to finalized even straight out of the camera. But there are a few things I have in mind as I compose my image that I can't always get in the moment, and so I do still use Photoshop for my final touches. Sometimes I add a light color wash, and sometimes the scene calls for a bright pop of color instead. I use Photoshop to artistically enhance the photo, bringing it close to the what I saw in my head when I originally captured the image. Actions are layered to create the mood I want to evoke (though layers are never used full-force). So the biggest editing tip I can offer that will save you LOTS of time, headache and heartache: Photoshop is best used for enhancement purposes instead of relied upon to "fix" your images. Thoughts, comments, or questions? I'd love to hear your responses and get a conversation going. You know how it goes... you're at a party. You WANT to show off the latest pictures of your kiddos, and (woohoo! ), the *perfect* opportunity just arose. You tell your friend, "speaking of such-and-such, you've GOT to see this picture of [insert-your-fabulous-child's-name-here]. " If you're super old-skool, you reach for your purse, dig through to locate your wallet, then sort through your receipts and various papers (ooh, a coupon!) trying to find the wallet-sized print you just KNOW is in there... somewhere. I PROMISE you, there's a better way. Be a rockstar with your own custom iPhone app and have INSTANT ACCESS to all your favorite photos! Click here to see my sample gallery. Not only great for your mobile devices, it's also perfect for viewing online. Ready for an app of your own? Contact me to get started with setting up your photo session. Lately I've been playing around a bit more with the concept of "styled" shoots. In the photography world, you might see these type of shoots referred to as "editorial," or "commercial/catalog" if done for a particular client. I've been embracing my inner artist, doing a lot of pre-planning and coming to the table with a definite vision... setting the scene with props, accessories, clothing, and certain poses/looks to capture a particular mood about it all. I'm still ME, so of course there's still a lot of PLAY involved. But the real magic happens in getting what I see in my head come to life before me, and transform into something even BETTER through the personality of the person I am photographing. The entire process is amazing, and sometimes takes my breath away. I want to share the experience with you all, starting with my "Vintage Spring" stylized mini-sessions, created with the kids in mind. And I'm offering my first round of Vintage Spring mini-sessions just in time to create a fabulous gift for Mother's Day! Sessions take place this Sunday, and there are only a few openings left, so click here to reserve your spot now! Click the image below to see my e-zine and read/see all the details! Let me assure you, this isn't the typical photo experience, and you won't end up with the typical prop-based photos. No cheesy grins or fake-ness here. 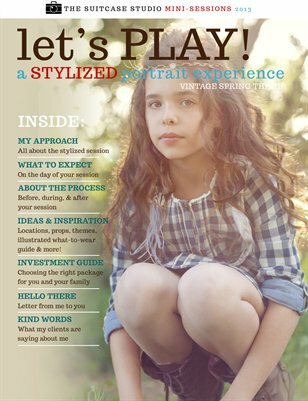 Instead, I will be creating one-of-a-kind keepsake portraits that make your child look as if they just stepped out of the latest magazine spread. One last chance... click here to reserve your spot now! I've been back from my Vegas/WPPI trip for a while now (recap coming soon), but my head is STILL swimming from all the awesome things I saw. After spending hours walking the tradeshow, visiting with new vendors (and re-visiting the next day), I am happy to be adding a few new products to what I currently offer. Beautiful hardback books and albums. Thick pages, custom covers, and photos in matte (my favorite) or glossy. These books/albums are virtually seamless, allowing images to flow across both pages with little distraction. Softcover books. Budget-friendly but beautiful, and made from 100% recycled materials. Wooden prints, wooden blocks, and wooden calendar holder (with paper calendar). Wood items were HUGE this year, and I could see why. Beautiful and unique, they make for incredible display pieces. But while I love these, I'm haven't yet decided if I will be offering them or not. Let me know what you think... yay or nay? If there is enough interest, I will definitely be adding these to my offerings. Custom Photo Jewelry! Please flip through the catalog below to see all that will soon be available to you. I am so impressed by this company, and can't wait to order a few pieces for myself, too!